Storing tires should be hard, but it doesn't have to be. Be Smarter than the average bear with an above average warehouse racking system for all of your tire products from Felix Loeb. Tires are one of the most important parts of a person’s vehicle. They do more than assist the car in getting down the road smoothly, they’re also used to provide safety as you hurtle on your way at 80 mph. Thus, it’s no shock that they’re a bit bulky. In fact, they’re absolutely heavy and cumbersome which is why so many workman’s comp claims are filed in tire shops and other auto centers in regard to tires. It’s easy to forget that you’re supposed to use your legs to lift rather than your back and then suddenly your employee has a permanent injury that will hinder their work and day-to-day life. What if lifting and tugging tires off your warehouse storage system didn’t have to be such a hazard? What’s the point of progress if you aren’t going to take advantage of the benefits? The new robotic vertical storage systems that can be installed in your warehouse can make accessing your wide variety of tires easier and safer for everyone. With state-of-the-art, from the ground operation, you locate the tires you need, stop the carousel and pull the product with extreme ease. Streamline your operations and improve the continued safety of your workers all with one intuitive solution. If you’re looking for a more simplistic approach, our mini tire racks are perfect for a less extensive inventory. They offer fast identification of product and provide easy, quick access to the tires you need. This rack can double as a rim or wheel storage alongside your tires, providing multiple storage solutions in one swoop. Felix Loeb is proud to help you find creative vertical storage solutions that work for your space and your business’s needs. Get a free project quote for your advanced storage and pallet racking needs in Chicago now. 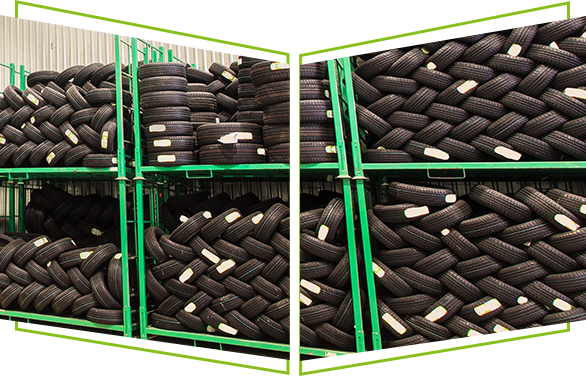 The very nature of tires make their effective storage an ongoing challenge. With properly placed and utilized tire storage racks, your automotive business can develop a system of storage and usage that increases your bottom line while decreasing risk to your workers and the facility itself. With our innovative tire storage solutions, one person can rotate the carrier frames, locate the desired set of tires, stop at the proper position and remove the product safely and efficiently while at ground level and all at the touch of a button. Reduce injuries and risk by letting the tire carousel do the lifting. These tire racks are known to decrease workman’s compensation claims. Our tire rack offers you storage, fast identification and quick access to your tires. The angled beams provide excellent support for your tires. The rack can also be used to store regular rims or wheels.